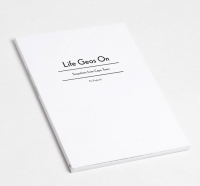 “Life Geos On” is a photo diary by photographer Per Englund. He has spent much time in Cape Town, South Africa and the outlying cities. In South Africa apartheid lingered at one level or another until 1994. The effects of apartheid, on the people and surroundings, permeate the photos vividly. A couple pictures portray Per Englund (white) being treated almost as if royalty, with presumably his slippers waiting for him in his hotel room in one photo to his greeting card and complimentary wine glass and tray in what looks like his hotel or place of residence. Other photos showed black South African residents who are in probable daily socio-economic struggle. The juxtaposition of showing this in the array of photos was brilliant. Then, some photos show unity, with a white male and black female in an embrace in a club setting. The unity of races after apartheid is obviously an ongoing effort in Cape Town and South Africa, but as the name of the book implies, life goes on. The name of the book is intentionally spelled G-E-O-S, not “Goes” which I didn’t notice until after looking at the book several times. I believe that the name of the book comes from graffiti that was scrawled in a particular photo that had misspelled the title in that way. This, the second work by Per Englund is superb. Only 1000 were printed, pick one up from Dokument Press while you still can. This entry was posted in Stories by Mitchel Jonas. Bookmark the permalink.